Wesleyan Woods is a state licensed public RV campground. We offer 225 sites, 50 sites are full hook-up. 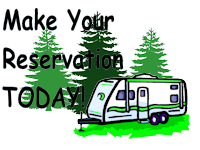 In addition, we have rustic tent sites and cabins available for those adventurous campers. Camping is open from May 1st to October 15th. Offseason camping may be available by appointment. Come and enjoy a family or group experience at our alcohol-free facility. For more information about our rates and packages Click Here. Each year, Wesleyan Woods sponsors a number of Camps, Retreats and Rallies. Our youth camps are becoming quite popular as we have seen attendance grow over the years. In addition to our youth/kids camps, Wesleyan Woods offers different retreats/rallies throughout the camping season. Strong Family RV Rally is fast becoming a popular weekend and our Hunter’s Retreat held in the fall is another popular weekend. All Wesleyan Woods sponsored camps and retreats are open to the public. For more information about our youth/kids camps Click Here. For more information about our retreats and rallies Click Here. Wesleyan Woods offers facilities that can meet the needs of your group. During the entire year, we host a variety of events, reunions, weddings, conferences, meetings, dinners and retreats for a variety of churches, schools, businesses, organizations, clubs, and families. Anyone of our facilities may be reserved for your special occasion! For more information about our facilities Click Here. Please contact our office for group rates and make your reservation today.